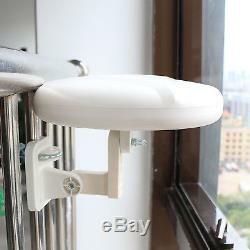 Modern and upgraded outdoor antenna for the reception of digital television broadcasts. Its compact size reduces wind load, providing much better signal reliability on windy or rainy days. Anti-UV coating and weatherproof design for durability and allow shielding for minimum interference. Durable materials for protection from various weather conditions such as sun, rain and snow. 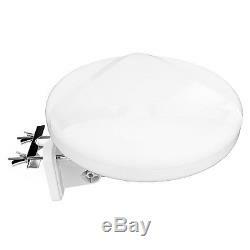 360 degrees multi-directional reception antenna receives signal from all directions. 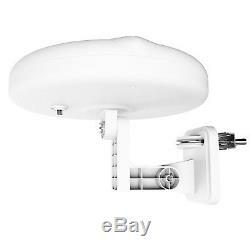 Easier to install with its included accessories than the much larger traditional yagi antennas. 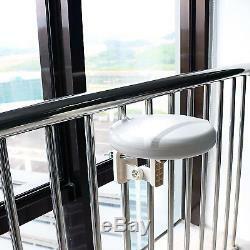 Compact, unobtrusive, omni-directional, tools-free installation design. 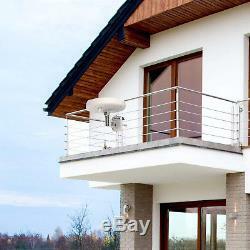 Various mounting options: balcony, attic, living room, window with mast, roof etc. Suitable for the home and portable use such as boats, camping, caravans, motor homes and trucks. Frequency range VHF 87 230 MHz and UHF 470 862 MHz. Receiving range FM, VHF and UHF. Antenna gain of up to 32 dB. Antenna dimensions approximately 297 mm x 240 mm. 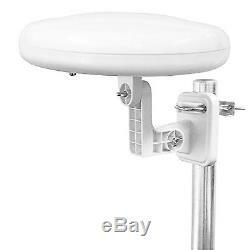 Includes antenna, power inserter and adapter, USB power cable, 6m coaxial cable, waterproof kit, stand and mast clamp, F female to IEC male connector plug, and instruction manual.